The transition to suspension Sf9 cells from monolayer cultures is not difficult but does depend on harvesting the attached cells at the right time. Too early and it is extremely hard to detach the cells from the culture flask. Too late and the cells will be in such poor condition that they may not recover when in suspension. Trying to describe in words how the monolayer culture should look prior to harvest is difficult. Therefore, we have prepared a series of images depicting Sf9 cells from just after they were dispensed into a monolayer culture to the point of harvest for transition to suspension. Before beginning our description of this process it is worth us reiterating why you might be keeping Sf9 cells in a monolayer culture when almost certainly you will be using suspension cell cultures for most of your protein production work. The monolayer format for maintaining insect cells comprises an excellent way to keep reserve or back up cultures. Even the best operators experience occasional contamination of their cells with microbes such as bacteria or fungi. Having some cells growing in smaller, slower growing cultures provides reassurance that if the worst happens and the suspension cultures are contaminated you can very quickly get back in protein production on a larger scale. These cells may also be grown slowly at ambient temperatures to minimize the number of times they must be sub cultured. Therefore, knowing the correct process for setting up suspension Sf9 cells from monolayer cultures can be critical. Figure 1. 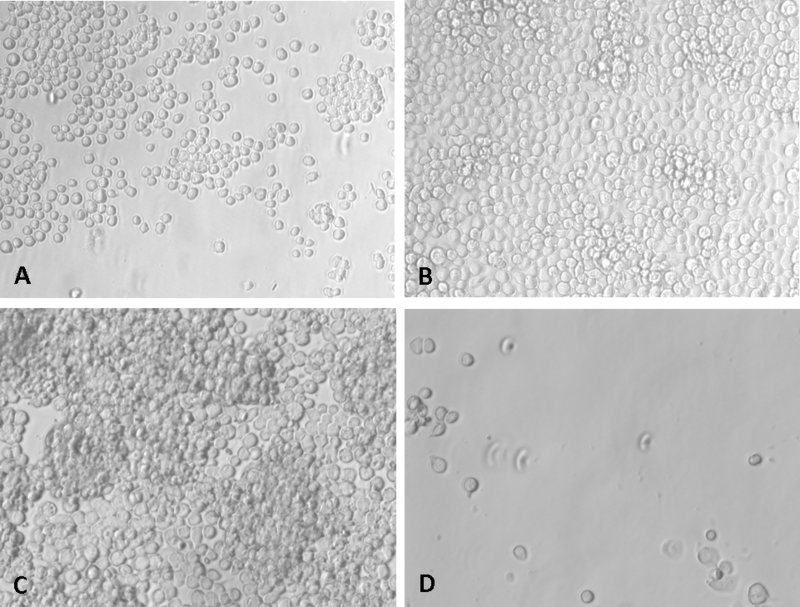 Sf9 cells in monolayer culture at 3 (panel A), 6 (panel B) and 9 days post establishment in a T25 flask. Panel D shows the same flask after cells were detached and removed from the flask. Figure 1 shows the series of images of cells from day 3 to day 9 post sub culture. The flask used was a T25 with a surface area of 25cm2 and was seeded with 2.5 x 106 cells in 5mls of ESF 921TM serum-free medium, which OET distributes. The cells were incubated at 28°C. You can see that the monolayer of cells, which was initially quite thin by 3 days, has spread itself over the culture flask by 6 days. Although these cells might be regarded as confluent, they are not ready to split or sub culture. At this cell density, if you try to harvest the cells by tapping the flask on the bench it is almost impossible to detach them from the plastic. They really do “stick like glue”, as the saying goes. Scraping the cells off is also ill advised as this seems to result in a very high mortality rate. Instead, we left the cells until day 9 (Fig. 1, panel C) before harvesting them. To the untrained eye these cells may appear to be too thick. (Of course, if they are left too long their viability will suffer). At this point, just three sharp raps of the flask on the bench surface were sufficient to release the cells from the plastic and enable their easy harvest. Figure 1, panel D shows the same flask after the detached had been removed. Very few cells remained attached. These cells were then successfully used to set up suspension Sf9 cells from monolayer cultures and further monolayer cultures in T25 flasks as part of our continued back up cell stock. What this simple test shows is that setting up suspension Sf9 cells from monolayer cultures need not be a difficult task. It just needs a bit of patience in letting the cells get thick enough so that they detach readily from the adherent state.